I signed up for MdS 16 and, after a quick search, realised Rory was the best coach to get me trained up for this event. It was a great decision - with his experience he made the impossible possible. I had heard of Rory via the internet and television. I needed someone to motivate me, train me and prepare me for this adventure. Rory Coleman quite simply fits the bill. Rory’s influence stretches beyond just the race. It is more of a philosophy. I am still enjoying running today and feel the MdS/Coleman experience has had a very positive affect on my life. Thank you Rory. He really is a top guy and his enthusiasm helps to drive you on when the going gets tough. I can honestly say my life is completely different to that of two years ago and it’s all thanks to Mr. Coleman! I would recommend getting in touch with Rory 100%! Working with Rory meant that I not only met my dream of completing the MdS but I finished in the top half. As side benefits I lost around 15 kgs. I achieved personal bests at the marathon, half-marathon and 10k and I also achieved a base level of endurance fitness that enabled me to finish an Ironman a couple of months later. I would strongly recommend Rory to anyone competing in endurance based sport or seeking to make fitness based lifestyle changes. 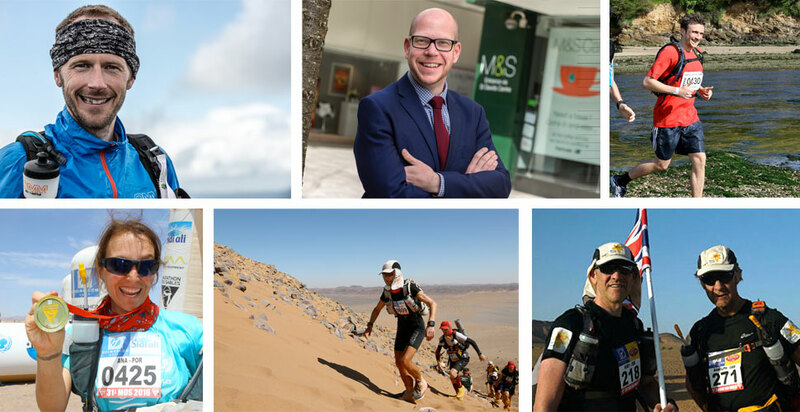 Rory’s holistic approach to training; his blend of considerable running experience, life coaching skills, common sense, compassion and professionalism got me to the start line of two multi day staged desert races. It was only because of his diligence and genuine empathy, giving me the necessary skills and fitness, making me believe I could do it, that I made it to the finish lines. Rory helped me run my first 100k Ultra in 2015, and then coached me to run the Marathon des Sables in 2016, and his knowledge of Ultras and MDS in my opinion is second to none in the world, cheers Coach. I will undoubtedly go back to Rory for more coaching over time, I genuinely believe he has a lot to offer me as I progress on my own journey. And like any true friend, the amount of time between our meetings won't dictate how quickly we can pick up exactly where we left off. Thank you so much for coming along and giving your talk, it was the highlight of the evening! So many of the guests said afterwards that they really enjoyed it and were inspired by your story. The background about your running successes had everyone in awe, then the questions really got people thinking. His honesty, personable style and total selflessness have enabled me to improve every aspect of my life in quite dramatic ways - including being alcohol free for 100 days. I can't recommend Rory enough if you, like me, know you can be so much more but need that extra support to help you be the best you can be. Rory’s approach was friendly, knowledgeable, accommodating and clear and for me, it was the platform on which the next 6 months training took place, culminating in a successful race. I would have no hesitation recommending Rory to anyone seeking guidance for any endurance event. Whether over the phone or in person Rory has always given me sound advice and guidance and left me feeling positive and ready to aim higher. He is now helping me train for my first 100-mile race. If you are looking to unlock your full potential and are willing to put in the effort, I have no hesitation in recommending Rory. Book some time with him and he will help you achieve. I would have absolutely no reservation in recommending the Legend to work with to improve any aspect of their life. He will be as committed as you to help your change, he will push, he will be straight, he will get you the results you want as long as your committed to the task. Not only did Rory prepare a detailed daily training plan, but he advised on nutrition, kit, injury-prevention and race strategy. Importantly, he also gave me a self-belief that I could be in the top 10 women, a goal I never would have considered otherwise; I came eighth. I would not have achieved that without him. Rory's coaching made me believe that it was possible to achieve my dream, and helped me evolve step by step, overcoming all the obstacles that came along the way. Rory was supportive, kind, focused and objective: all the ingredients I needed to succeed. I surely recommend his services, and I will come back when another crazy adventure comes to mind! Rory made me believe it was possible to push myself further, train harder (and smarter) and run quicker times. His training programs have been very tough and I was surprised that I could complete all of the sessions. But they certainly work. I would absolutely recommend Rory to anyone who wants to improve their running. I no longer need to enter the London Marathon ballot as I have run my last three marathons at a pace that qualifies for automatic 'good-for-age' entry! I've improved my race times at all distances. I would definitely recommend Rory's training sessions and plans to anyone, whether you've reached a plateau, are interested in what you could achieve, or just want to shake up your training schedule. I was part of one of the first Average2Awesome groups and would highly recommend Coleman Coaching. ‘Simon has never been much of a runner’, was a phrase often heard while growing up. Rory and Jen pushed me to do things I never thought I could. Losing 10Kg was a plus too! ULTRAdiet and running has become a way of life and I feel much better for it. Knowing I can achieve more if I push myself more has been a revelation. I ran my first marathon last year and it wouldn’t have been possible without their help. I came to Rory as a novice runner, on the verge of quitting, with no idea how to train properly. I lacked self-confidence or structure and was stuck in a rut. Rory helped me to not only achieve my running goals but also change my diet, which has helped me to lose significant weight and keep it off through a healthier lifestyle. He has also aided me in a professional work capacity. He listened to the issues I had, gave advice where needed, but more importantly supported and empowered me to make changes to my life that were needed. He helped me to see that I was the one holding myself back and that only I could change that. He helped me gain the self-confidence I needed to take the decisions that have turned my life around. If you want honest, inspirational, straight talking coaching and mentoring, then look no further. I started with Rory in early December this year, with the aim of improving my fitness, running and lifestyle by next year when I will move to a new running age-group. Rory gave me a three-way plan, including training, diet and gym exercises which I followed to the letter, resulting in the loss of over a stone in weight, greater self-confidence, and recognition from my fellow running club members that the plan was working. Rory’s methods are very successful if they are stringently followed, he is an expert in his field, and I’m looking forward to seeing continued improvement over the following months, with guidance, and the odd proverbial kick up the backside. Thanks a million, Rory! Dechreuais gyda Rory ddechrau mis Rhagfyr eleni, a sylweddolais yn gyflym bod rhaid imi ddilyn ei gyngor a’r cynllun hyfforddi yn union. Roedd y sesiwn cyntaf yn y gampfa yn anodd, ond dilynais y cynllun a cholli dros stôn yn raddol a oedd wedi fy helpu i redeg yn gyflymach. Mae dulliau Rory yn gymysgedd o glodfori, rhoi cyngor, a dweud yn union beth sydd angen er mwyn gwella perfformiad. Rwy wedi gwneud llawer mwy nag o’n i’n disgwyl, mae e’n feistr yn ei faes, a dw i’n edrych ymlaen at wella fy rhedeg dros y misoedd a blynyddoedd i ddod. Diolch, Coach!